It’s a crazy world. Our 2009 German calendar that I bought for $12 is being sold for $85 on Amazon. A poll has found that Australians buy more and then waste more food at Christmas than during the rest of the year. And the Scots celebrate Hogmanay with a sheep’s stomach full of offal. They call it haggis. Even meat-lovers cringe at the idea. Fortunately there is a vegetarian alternative that is much better. And I have finally found a great way to serve it. Would you believe, haggis nachos! E and I have been eating home made vegetarian haggis on New Year’s Eve for the past 6 or 7 years but this year I finally found inspiration in serving it. For those who are unaccustomed to eating haggis, it tastes a bit like minced meat and the vegetarian haggis is a great substitute for minced meat for those like me who dislike TVP and other veggie mince. In the past I have found that serving haggis with mashed neeps (turnip or sweet or rutabaga) and tatties (potatoes) as unsatisfactory as serving meat and three veg. After some searching I have hit gold. Haggis nachos was just the beginning. With the leftovers, I made haggis neeps and tatties pasties and then haggis neeps and tatties crepe stack. So I present to you three ways to serve haggis. New Year’s Eve has passed but you might like to keep these ideas in mind for Burns Night on 25 January. 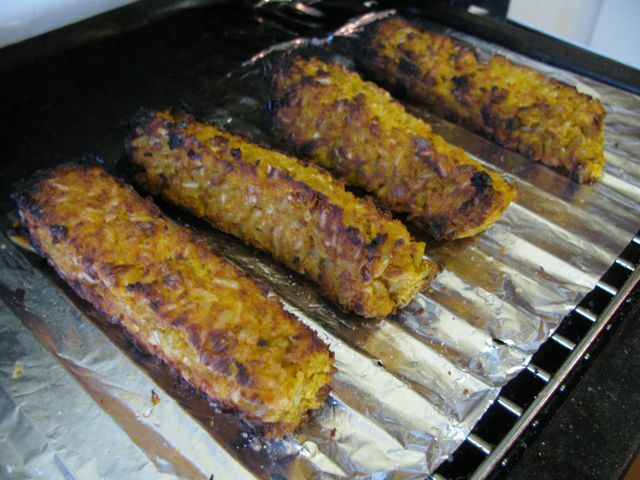 New Year’s Eve was a hot day and the idea of putting on the oven was repugnant so I cooked these in the microwave. I made a few changes to my usual recipe so I have written what I have done below. This year the house seems even more disorganized than usual. No matter how much cleaning I do I just can’t get on top of it. Sylvia does love to spread her toys, our CDs and any papers she can get her hand on, over the floor. Usually I set a festive table for New Year’s Eve but this year with E being poorly and Sylvia keeping me busy, I didn’t have the energy to set the table. We just ate on the couch. 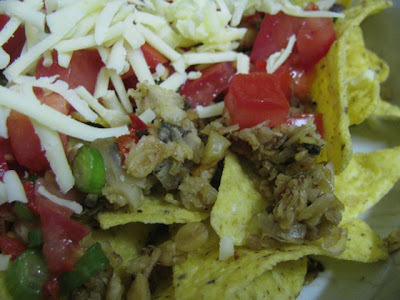 Haggis nachos are excellent for a casual meal on a hot night. 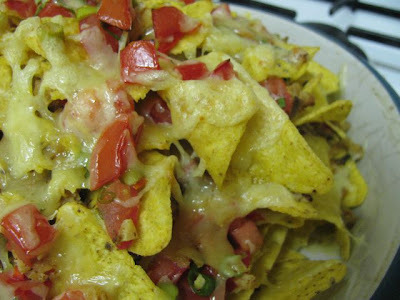 They could even be gluten free if you had gf oats and yeast extract (and I am not sure about whisky) It is ages since I have made nachos. I love them but need them to be substantial enough for a meal. I often add a chilli non carne or vegetables. I think these were among the best nachos I have ever made. E is already asking me to make them again. Though it was no surprise that he loved them, given that he hadn’t eaten all day. 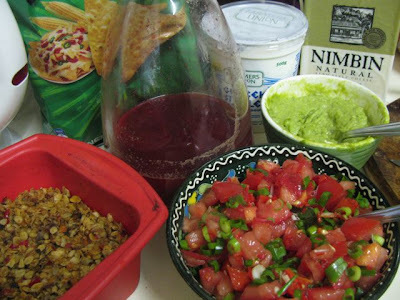 I based my salsa on the pico de gallo one I made a couple of years back. 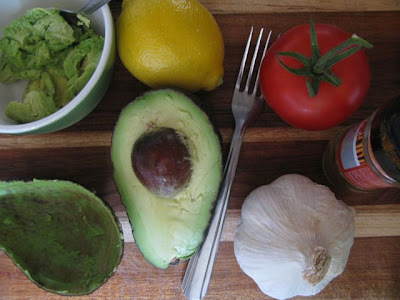 Unfortunately for the guacamole I had the perfect avocado, bought that day – what are the odds – but I overdid the lemon juice and then overdid the salt so it wasn’t my finest guac. Reminder to self: go slowly with seasoning. However, the haggis was underseasoned and in the final mix, it all tasted fine. When I had a quick look at the internet to see how others had done nachos I found that salsa was often served after the nachos were cooked. But I preferred it in the mix when I cooked the nachos and found it melded with the haggis and cheese pleasingly. Quite a few did their nachos under the grill (broiler) but once I had mine together the pile was too large and reluctantly I turned on the oven. I had a bit of a problem with my timing to get them warmed right through. Next time I might do them longer or even spread them thinner in a bigger tray to help them cook quicker. 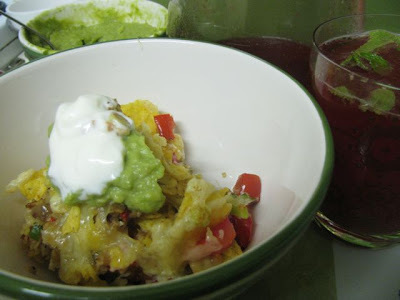 There is nothing like the delight of pulling at hot corn chips which are crisp at the corner and soggy with haggis and salsa which are held together in a clump with melty cheese and topped with cooling guacamole and yoghurt (or sour cream if that is your preferene). In an ideal world I would just put the hot tray of nachos in the middle of the table to dig into but Sylvia chose the moment when I was serving to wake up and it all became too impractical. So I used tongs to scoop some into a small bowl and spooned some guac and yoghurt over them. So so so good! Even more delicious with some raspberry punch. It seems like a good place to end the post here but I must tell you how I used the leftovers. My next inspiration came from MangoCheeks. One of my favourite places for lunch in Edinburgh is the baked potato shop at the top of Cockburn Street. They do a great haggis on baked potato. I was tempted to go in on our recent trip but the palaver of getting the stroller into the small space was too much and we gave it a miss. Imagine my jealousy to see that MangoCheeks on the same weekend had gone there and got vegetarian haggis samosas. I wanted one. I am intimidated by the idea of making samosa but I can easily knock up a pastie. You may have noticed that my non-traditional use of haggis on New Year’s Eve went as far as omitting neeps and tatties. Here was my opportunity to make amends. 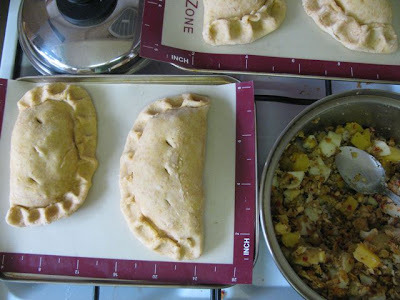 I boiled some very well seasoned neeps and tatties and made them into a pasty with the haggis. 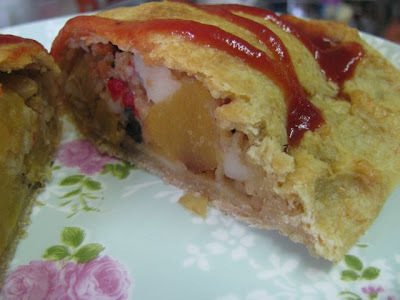 I used the hot water pastry I had made previously. It worked even better this time than my first try. I decided against using an egg to glaze it because it just seems a waste of an egg and used soy milk instead. I also worked out how to make them look more professional. Delicious with tomato sauce. My final reincarnation of the haggis was in a crepe stack. This was inspired by my recent pumpkin and ricotta crepe stack. 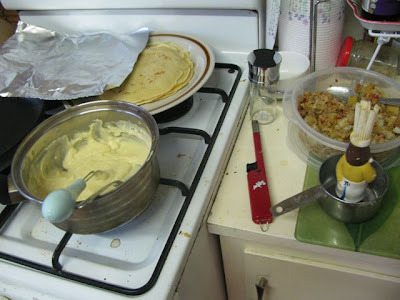 It was my first success with crepes and left me wanting to try more, especially savoury versions. This stack wasn’t as successful. I made a cheese sauce to help it stick together but I think the fillings were too chunky and it didn’t really hold together when I served it. While it didn’t look great once cut into pieces, it tasted good and even my mum enjoyed a little taste. 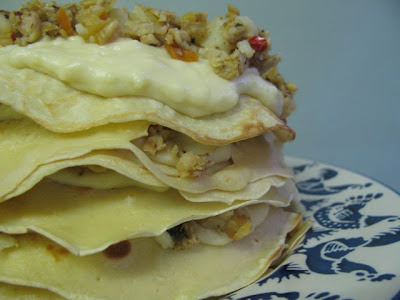 I am going to try more savoury crepe stacks. It wasn’t a bad first attempt but I hope they will improve. I think a thinner sauce would be good. 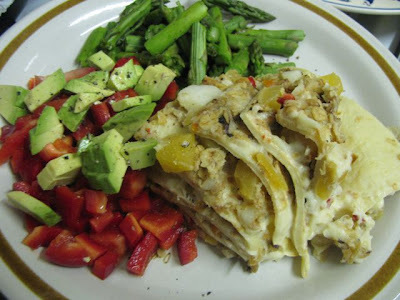 I love the way the blog seems to develop organically with meals morphing and inspiring me with new ideas and leftovers. Once all the haggis was finished, I asked E which dish he enjoyed the most. He emphatically chose the haggis nachos. I agreed. They were superb but all these meals were great. Many pubs will do haggis in Edinburgh but I find it quite dull with mashed neeps and tatties. I hope these ideas will help do away with the sorry reputation of the haggis. The vegetarian version will upset the purists but it is really so good you must try it. Finely chop carrot, onion, mushroom, and beans. It is easiest to use a food processor so the mixture is very fine but I just used my chef’s knife, a chopping board and a good dollop of patience. Melt remaining margarine in the frypan and fry the vegetables and beans for about 2 minutes. Return oats and nut mixture to the frypan with the vegetable mixture. Mix in the remaining ingredients and cook another 5 minutes. NOTE: I had a visitor at this point and forgot the dried herbs and pepper and this was a little under seasoned but that was fine in the below dishes. But if you are not using in those dishes, you might want to check seasoning and also if it moist enough as the recipe suggests some extra melted margarine or veg stock if it is a little dry. Place in a 13 x 22cm silicone loaf pan (ungreased). 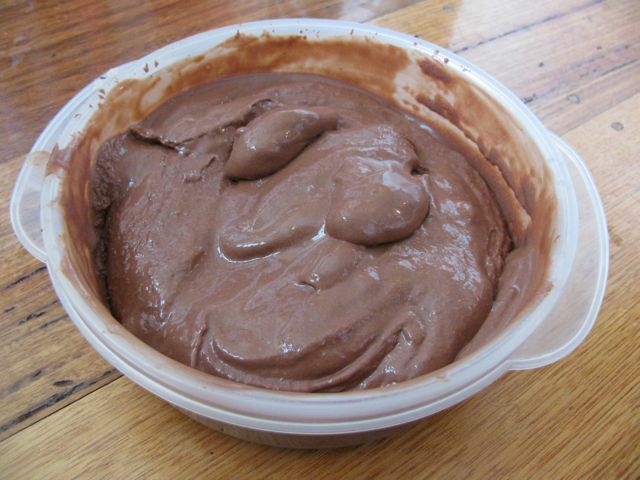 Press down and smooth with the back of a spoon. Cook 5 minutes in the microwave on high. Cool in the pan. 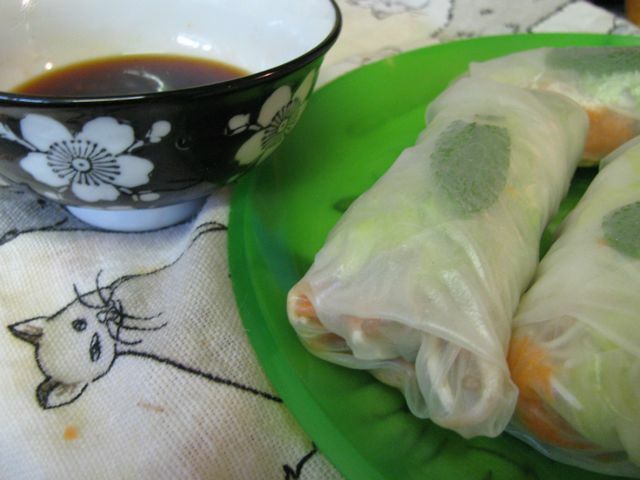 It can be kept in the fridge for at least 3 days and reheated in the microwave. 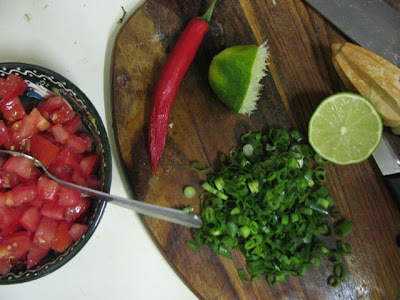 Firstly, make the guacamole but mixing all ingredients together – start with just a little lemon juice and salt and add more according to taste – and make the salsa by mixing the ingredients together. Now take a large oven proof tray. 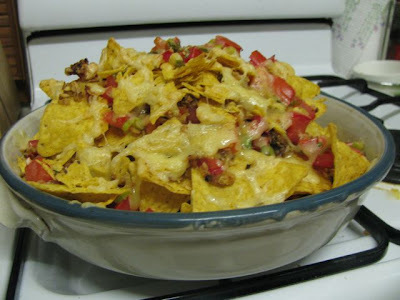 (Mine is about a 25cm round ceramic dish) Layer ⅓ corn chips, ½ haggis, ⅓ salsa, ⅓ cheese. Repeat layering and then finish with corn chips, salsa and cheese. Heat in oven at 180 C for about 20-40 minutes. I only did 15 minutes and it was not enough to heat through but it depends on your oven. Serve with guacamole and yoghurt. 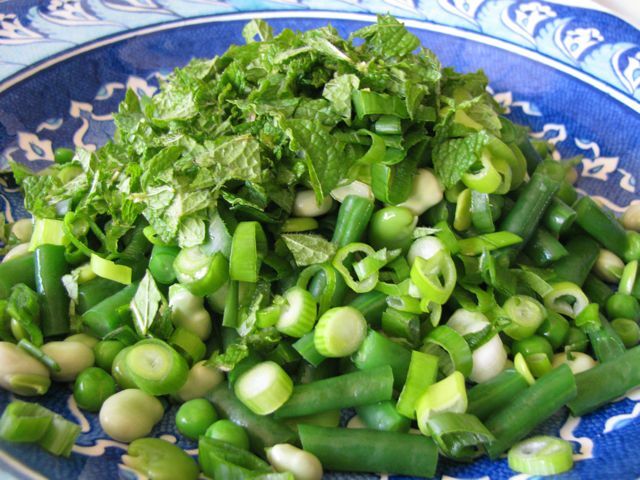 To make filling, boil potatoes and turnip in well salted water until soft. I cooked them together but I think the potatoes took about 20 minutes and the neeps took about another 20 minutes before they went soft, so you could cook them separately. Mix with haggis. To make pastry, pour hot water over margarine in a medium saucepan and bring to the boil. Remove from heat and stir in flours and salt. It will be stiff and a little crumbly but once you use your hands to press it together it should come together into a smooth ball. Cut ball into four pieces. I found that the outside hardened a little on remaining pieces while I used first piece but they still rolled out fine. 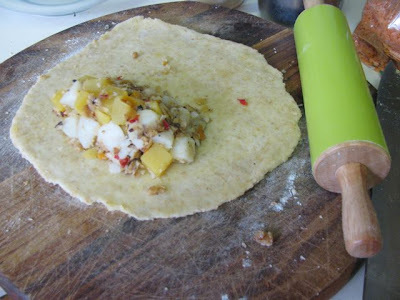 Use a rolling pin to roll pastry out to a circle of about 20cm diameter (about ½ cm thick). Place two to three dessertspoons of filling towards the bottom of the circle, leaving about 1cm pastry around the edge. Use your fingers to press the filling into a neat half circle. Use a brush or your fingers to moisten the edges of the circle with water or soy milk. 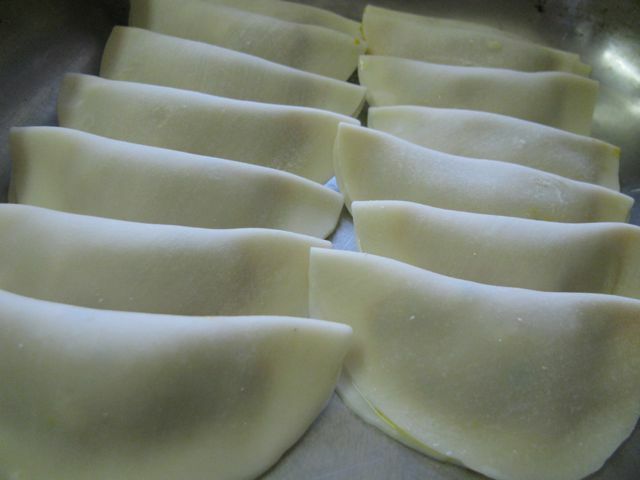 Turn over the pastry to cover the filling and use your fingers to press together to seal the filling in. Now if you want your pasties to look good, I found that it was best to moisten the edge again and fold it over once more and use two index fingers to press together quite firmly to make indents along the edge. Brush with soy milk. Make a few slits with a knife to let steam out while baking. 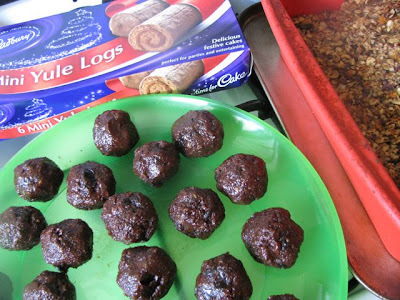 Bake at 200 C for 10 minutes and then at 180 C for 30 minutes. (Or if you get confused like me, at 180 C for 10 minutes and then 200 for about 20 minutes.) The pasties are ready when they are golden brown. To make the white sauce, melt margarine in a small saucepan. Stir in flour and mix over low heat for a minute or two. Gradually whisk in milk to make a smooth thin sauce. Bring to the boil so it thickens slightly. Stir in cheese until melted. This will make the sauce thicker so you might need a bit extra milk if it is too thick. To make crepes: Whisk together eggs and milk in a small bowl. Place flour in a large bowl and gradually whisk in egg and mix mixture. Add butter. Leave to stand for about 30 minutes. Fry quarter cups of batter in buttered frypan over medium heat for about 30 second each side till just golden brown. Stack cooked crepes on plate under foil to keep warm. To assemble, place a pancake on a serving plate, spread thinly with a spoonful of warm cheese sauce. 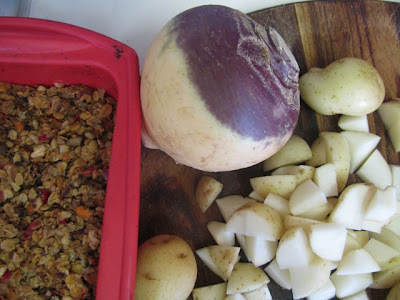 Top with a spoonful or two of warm haggis filling. Repeat until you have used final pancake. Top with remaining cheese sauce and haggis. I would have liked thinner cheese sauce that might have trickled down the side but it wasn’t to be. Serve in wedges. New Year’s Eve for many is a triumph of hope over experience but I have got to the stage in life where I am quite happy to stay at home with E and Sylvia, watch the Edinburgh Tattoo on the telly, eat haggis and compile lists. My computer has been making life difficult for me but if you read this post you will know I have triumphed over technology to reflect on 2010. It has been an intense year requiring a lot of adjustment. Some change has been delightful. Sylvia has grown from a little baby sitting on the rug eating mush, to a running, climbing whirlwind who charges around with dolly in the pram, demands bikkies and cake, and feels she should be sitting on a chair not a highchair. Returning to work after a year of maternity leave was challenging with a wee one at home and constant change at work. There have been other changes too. E’s mother and my grandmother died this year within months of each other. Friends and family have left Melbourne. We got digital tv. E has a new job. We have a new car. The backyard continues to fill up with Sylvia’s playthings – cubby hut, tricycle, sandpit, balls and a noisy plastic lawn mower. We sought highchairs and portacots on holidays in Sydney and Port Fairy, hardly went out to cafes and the cinema but spent more time in parks, and learnt a whole new language from Sylvia. I have barely had time to look at the new cookbooks of the year but amidst all the busy times I have managed to continue blogging (hurrah - who needs sleep!) 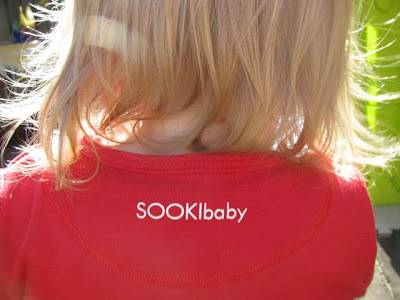 so here are some lists of highlights of 2010 – a best of, and a blogging round up. Blog Housekeeping: New lists included Index of favourites, List of pizza toppings, and List of salad dressings and a List of gift ideas. Started including "Previously on GGG": links to posts at the same time in previous years on all my recipe posts. I sold my soul and accepted my first blog freebie. It was a pass to Taste of Melbourne, which only caters for vegetarians if you have a sweet tooth. Every bit as interesting and overwhelming was Eat Drink Blog – Australia’s first blogging conference. 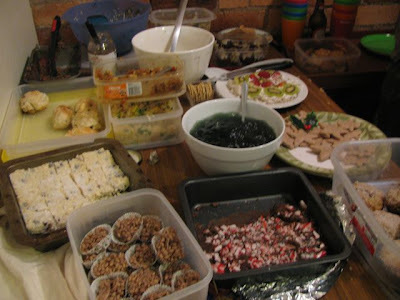 Best of all were the vegan bloggers potlucks that I was fortunate enough to go to this year. 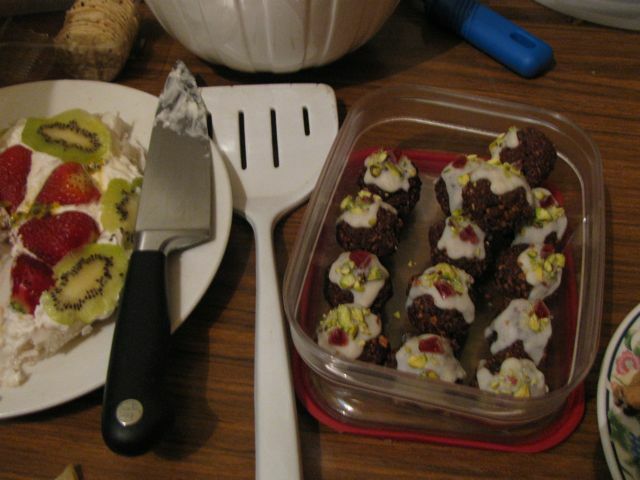 It was so much fun to taste some of the food that appears on these blogs. This is my 732nd post. I have been blogging long enough to feel overwhelmed at all the recipes I have posted and yet I have plenty more good food that I hope to share, plus some more reflective posts. I continue to find blogging a wonder of connection and discovery, a portal to good food and food friendship and a way of keeping my horizons broad. Thanks to everyone who had shared food with me, entertained me, made me laugh, supported me in the hard times and brought some happiness into my life. Particular thanks to E, Sylvia and my family. May your 2011 be filled with good food, good company and good times! We're having a post-Christmas slump. Too many leftovers and too little energy for new recipes. So I am digging into my backlog of draft blog posts for a second installment of search ideas that amused and amazed me. For more search term fun, have a look at my first post on In search of . . . Enjoy! i wonder if anyone ever milked a giraffe...bet they didn't need to sit down to do it...wonder what giraffe cheese pizza tastes like. Christmas has come and gone and much good food has been set before me. I hope everyone has been enjoying the festivities. As it is the season to be jolly, I want to share with you the Christmas dinner I made for us on Christmas eve. I stumbled upon Wing-it Vegan’s ideas recently and couldn’t resist trying them. 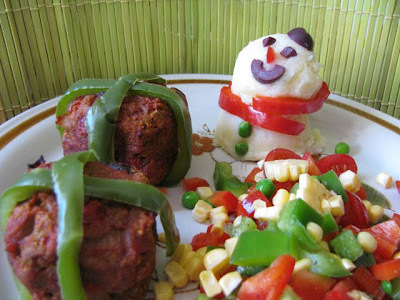 The mashed potato snowmen were quite simple. What is it about mashed potato that makes creative Christmas food – stars and Christmas trees and snowmen! I was so excited by the idea I ran out to buy an ice cream scoop. River had used different sized scoops for the head and body but I could only find one. 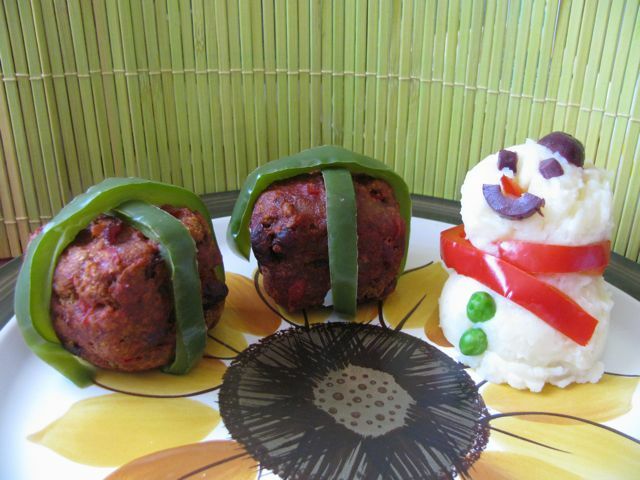 To make the snowmen I boiled some red capsicum till it was soft and wrapped around the neck easily. I cut a strip lengthwise and it wasn’t quite long enough – maybe I should have cut it around the body like peeling an apple. I used olives for the hat, eyes and mouth, red capsicum for the nose and peas for the button. River made Christmas parcels from sausage crumbles. This is not something that we have in our shops – and even if we did I suspect I would still prefer a nut roast recipe. So you will not be surprised to hear that I created my own nut roast recipe, making it quite stiff so I could shape it into parcels. I used River’s idea of the glaze and capsicum “ribbons”. Mine wasn’t quite so pretty but they still looked cute and they tasted wonderful. Fortunately I am quite partial to nut roast because I also had one on Christmas day with mum’s roast dinner. Dessert is becoming a lavish affair at Christmas with pudding, pavlova, rolled pavlova and chocolate mousse. I am an old fashioned girl who just loves a piece of pudding with custard. It was a good Christmas with lots of good food and good cheer. Sylvia got a new pram from Santa. It is actually for her dolly but she loves to sit in it. 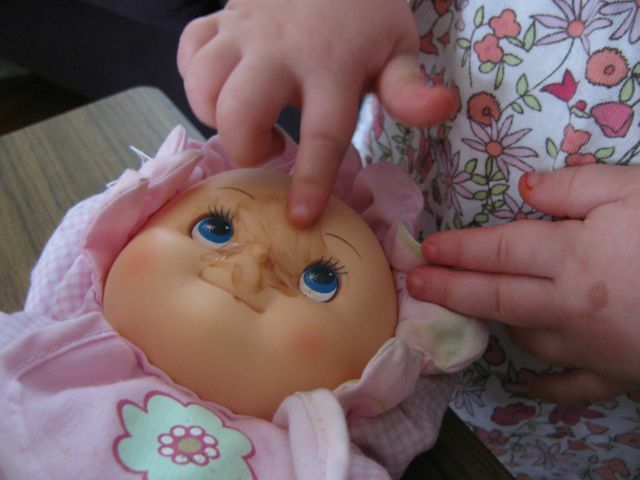 She also got lots of noisy toys – a talking doll, a train, books with musical buttons and even a jigsaw that makes animal noises. I guess the batteries will wear out eventually! E and I managed to give each other the same DVD (30 Rock Series 2 because we enjoyed watching series 1). E also gave me an external hard drive and was grinning to himself on Christmas Eve when I found that my computer memory is full and needs some rigorous housekeeping. Heat oil in a large frypan on medium high. Cook onion, carrot, red pepper and garlic until soft and starting to brown. I think this took me about 15 minutes. Meanwhile place remaining ingredients in a medium sized mixing bowl. Add cooked onion mixture and mix till combined. Take handfuls and shape into 6-8 cubes. Place on a greased or lined tray. 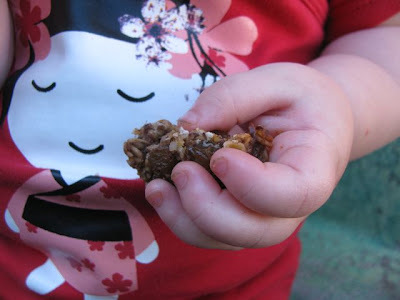 Mix glaze and brush onto nut roast cubes. Bake at 210 C for 15 minutes. Flip cubes over and brush with glaze again. Bake another 15 minutes. 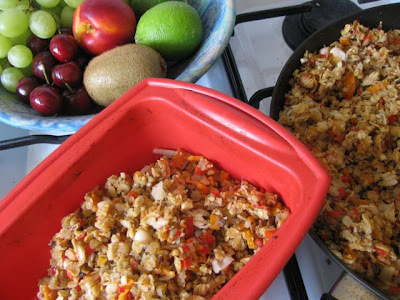 While nut roast parcels are baking, steam, boil or microwave capsicum until quite soft. I boiled mine for about 5 minutes and they weren’t done enough. So I placed them in a plastic bag and microwaved them until very soft. I felt very Christmassy last Sunday. 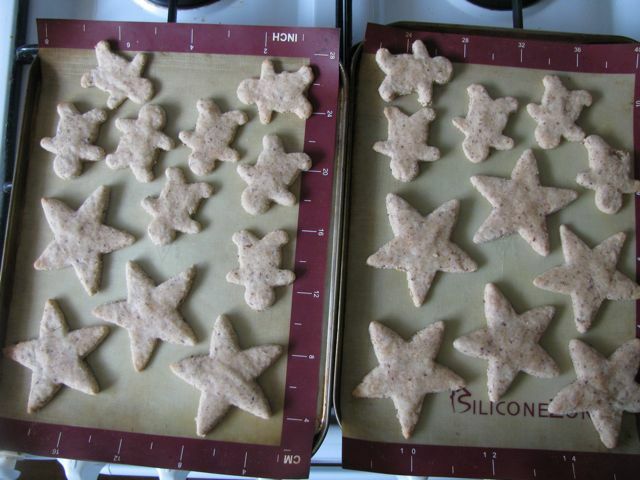 I made Christmas biscuits while Sylvia ate breakfast. We headed down to Geelong to help decorate my parents’ Christmas tree with my family and then back to Melbourne for a Christmas potluck at Lisa’s. These biscuits were easy to whip up at the start of a busy day. Exactly what I needed. Life just doesn’t seem to slow down at the moment. I hope I have made my last trip (of many) to the shops this morning. 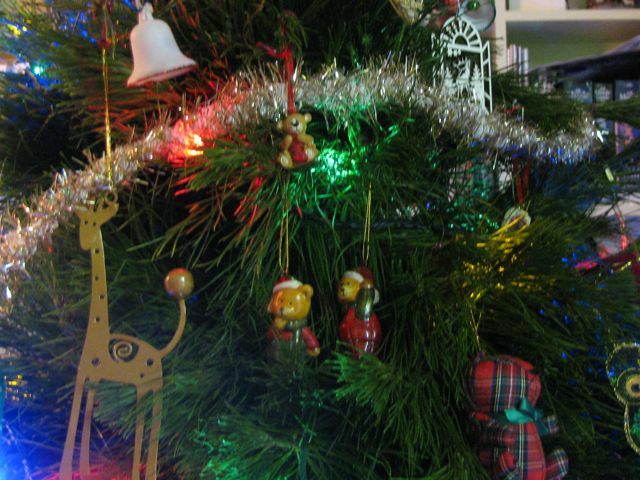 The tree is twinkling thanks to Sylvia who keeps demanding we “turn on” the lights. The pudding is in the fridge. I made fruit mince and panforte yesterday but still need to make more mince tarts and, of course, my Christmas nut roast. 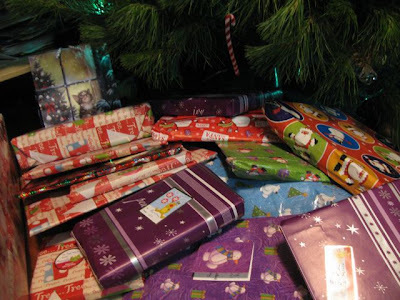 There are presents to wrap and packing to do before we go to Geelong tomorrow. 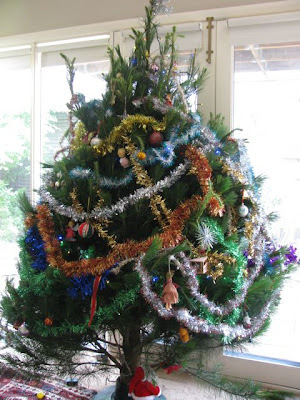 We helped to decorate mum and dad’s Christmas tree on the weekend. It was the usual chaos with ladders and tinsel and a lost star. Mum made pizzas and mince tarts and Nigella’s guiness gingerbread. Sylvia ate her first mince tart – one of my mum’s home made ones. She got three-quarters of the way through it, which was a pretty good effort for a first one. We came home and had a little time to try (unsuccessfully) to feed Sylvia before heading out to Lisa’s Christmas Potluck. There was an overwhelming amount of dishes to fill my plate with. The savoury food that I tasted included Lisa’s cauliflower pie, Thai curry, fried rice, lentil slice, Toby’s mushroom tarragon pate (that I foolishly thought was eggplant in a moment of confused tastebuds), chilli non carne, roast potatoes (which Sylvia loved), mango rice salad. I have probably missed out on a few but it was a glorious spread. When the desserts came, I was a bit more restrained and kept going back as I saw others enjoying or recommending treats. 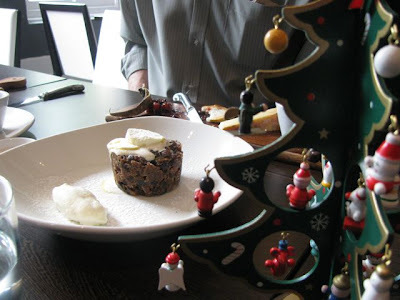 We had Cindy’s cute Christmas pudding bites, the GF pumpkin muffins, Anika’s white Christmas, chocolate crackles, and of course Sylvia had to have bikkies. I didn’t have the blue jelly or the vegan pav but now regret it as when will I next get the chance to eat such food. Sigh! I did try Kristy’s candy cane fudge. E was raving about it as we went home and I had a dream about it that night so it made quite an impact. It was a lovely relaxed gathering. Veganator brought along a CD of Bob Dylan Christmas song to help us feel that little bit festive. 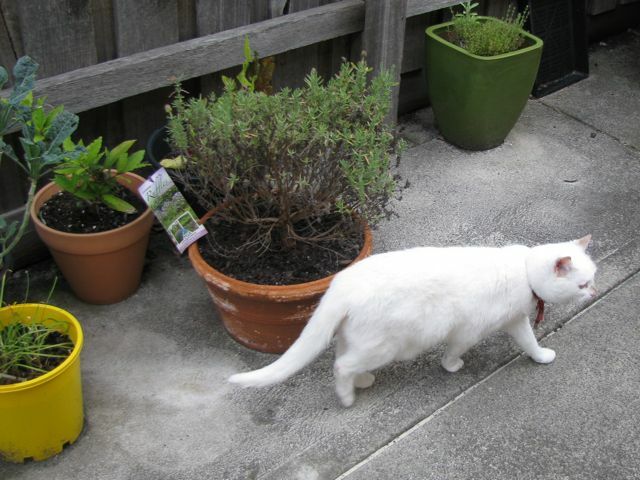 Sylvia was scared to tears by Lisa’s little dog, Kimba, coming too near but was quite fascinated to watch Kimba bark ferociously (as only a tiny dog can) at guest dog Stumpy. I was quite glad to be at a vegan gathering rather than at home with the neighbour cooking meat on the barbecue, and Lisa’s is a nice short walk away! But going home, we caught the start of the rain and were happy to be in watching the Midsomer Murder Christmas Special on the telly by the time it got really heavy. It has been an unseasonally cold December. Probably not cold compared to the snowy Northern Hemisphere but not the warm weather we expect in a Melbourne summer. 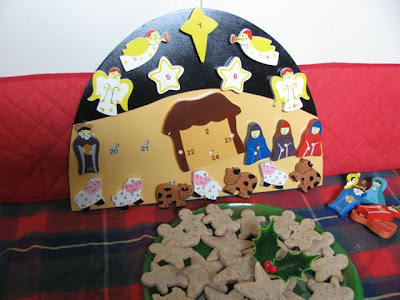 However the sun is finally showing its face and we are headed for a pleasant Christmas Day of 28 C.
If you want a last minute Christmas gf vegan biscuit (or cookie) recipe, I could highly recommend these biscuits. The dough was surprisingly easy to handle and didn’t need to sit in the fridge. The final bikkies tasted like marzipan – not surprising given that the mixture was mainly ground almonds and sugar. Too sweet for my liking so I would reduce the sugar next time I make them but they were delicious. Sylvia loved them and I confess that despite all the sugar, I have given them to her once or twice when I feel she hasn’t had much protein in her meal. They are from a German recipe so the proper name is Zimsterne. I made quite a few with my gingerbread cutter which is my smallest and appeals to Sylvia. I wondered if these might be called Zimherren. 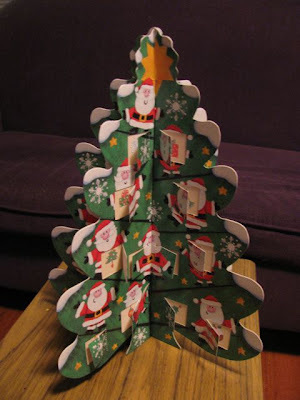 Well I must push on and get myself organized for Christmas tomorrow. Wishing you a) Merry Christmas, b) all the best for the solistice and the coming of longer or shorter days, depending on which side of the equator you live, c) happy and healthy holidays, or d) all of the above. Mix linseed (or flax seed) with water and set aside. Place dry ingredients in a medium mixing bowl. Add brown rice syrup and linseed mixture. Mix until it comes together in a ball. It doesn’t look like much liquid but if you persevere, it will come together into very malleable pastry. 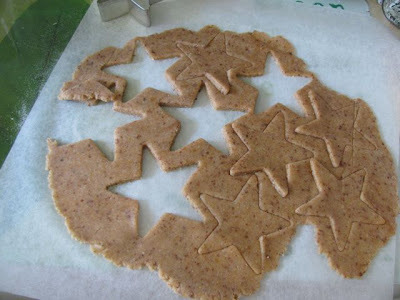 Roll out the pastry thinly on a lightly floured board and cut out shapes. My gingerbread cutter is smaller than my star cutter so I made more gingerbread men to make it go further. Bake at 160 C for about 8 minutes or until just turning golden brown. Cool on tray. UPDATE November 2016 - Also check out the updated recipe on Seitan is My Motor for these stars with aqua faba instead of linseed/flax. I am an ice cream novice. I don’t own an ice cream maker. I don’t eat the stuff often. I don’t even understand it. So why would I make my first batch of ice cream last week? 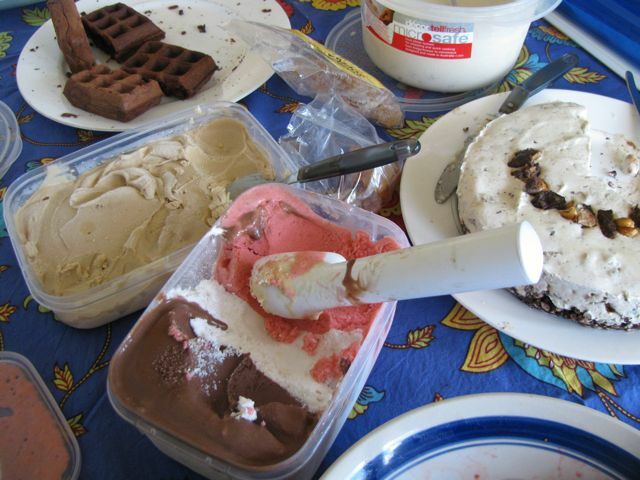 A vegan ice cream potluck! ...Until Cindy announced her vegan ice cream potluck. Even then, I toyed with the idea of making wafers or some other accompaniments. But I decided to grasp the nettle and searched the net for a simple ice cream recipe. I haven’t had lots of time and energy to trial ice cream making or to seek out recipe and odd ingredients. I was just happy not to have eggs in the equation. Hurrah for vegan ice cream! After many ideas, I settled on chocolate ice cream. The recipe I used asked for vegan choc chips. I didn’t have time to look for these so I just used Lindt 70% chocolate, which I suspect is far more bitter than the choc chips in the recipe. 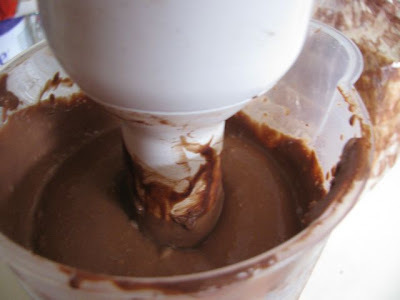 I searched for tips for ice cream making without a machine and found helpful ideas from David Lebowitz and StoneSoup. Lots of air and lots of sweetener seemed useful in keeping it creamy. Alcohol apparently slows down the freezing too but I wasn’t going there with booze buses out and about for Christmas. Hence my liberal use of the hand held blender, as noted in my take on the recipe below. I also had “little dolly” on hand to “taste” (“Taste” is a new favourite word of Sylvia’s). I set out for the potluck while Sylvia slept, feeling a sense of achievement that I had even managed to make some ice cream. Arriving at Cindy and Michael's home, I knew I was at the right place because it smelled as sweet as an ice cream parlour. Later I found that this was because Michael was making waffles. On the tables was a fascinating spread of ice cream, waffles, berries, cherries, sprinkles and even the glace cherries to finish off each serve. 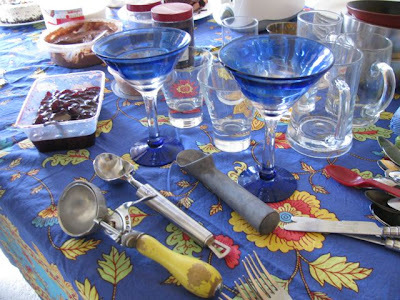 I was especially envious of Cindy’s ice cream scoop collection and realised I don’t even own one! The ice cream that most amused and entertained me was Cindy’s Neapolitan ice cream because it looked just like the one we would eat as children with the blocks of chocolate, vanilla and strawberry. But one bite of the strawberry ice cream demonstrated the difference between Cindy’s fine ice cream made with real strawberries and the one of my child hood that I think was filled with colouring and flavours. I also enjoyed Kristy’s amazing chunky chocolate honeycomb ice cream cake, some peanut butter ice cream, a caramel ice cream and Veganator’s molasses vanilla ice cream with candied walnuts. It felt very decadent to spend an afternoon eating ice cream with waffles and berries. I confess I got to the stage where my ice cream started to melt together in my bowl so I got a bit confused about which flavour came from where. As usual I missed a few interesting ice creams too. I had a bit of my chocolate ice cream with the others and found it quite bitter compared to the sweeter ice creams. I am still a bit uncertain about making ice cream but it is quite exciting to have started experimenting. Thanks Cindy for opening up a window into a new world! 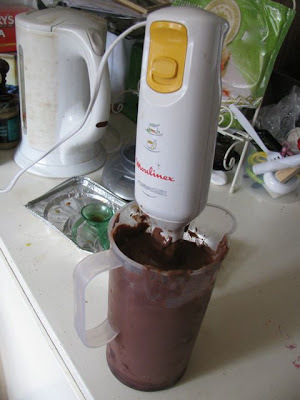 I melted the chocolate in a tall plastic jug that I use for my hand held blender. I added the remaining ingredients and blended them together to make a smooth and creamy “custard”. Check for sweetness – this is quite bitter but I liked it that way. I put it in the freezer and took it out about every hour for 7 hours. By then it was still not hardening so I went to bed and left it in the freezer overnight. In future I might leave it 2 to 3 hours until it had got a bit colder and then given it another 2 to 3 hours where I blended it every hour. The day of serving I took it from the freezer and let it soften enough to scoop it into a plastic container with a lid (I meant to leave it 15-20 minutes but got distracted and left it quite a bit longer). Then I blended it again and returned to the freezer to firm up a bit before serving (but I only had about 30 minutes to re-freeze it, then had it in the car and then put it in Cindy and Michael’s freezer for a bit but it was still really soft). It has lasted a week and a half and probably would last longer in the freezer. We put up our Christmas tree today. All the Christmas decorations are out. You can see some of them in my photos. I have almost finished Christmas shopping and am planning to do some Christmas baking over the next few days. So I have been thinking about foodie gifts ideas and was surprised just how many lurk in my blog archive and remembered other bloggers' ideas. I started mental lists that I had to write down. Sweet foods dominate traditional foodie gifts. I guess this hails from a time when sugar was hard to come by. These days, so many people I know are trying to eat more healthy food. 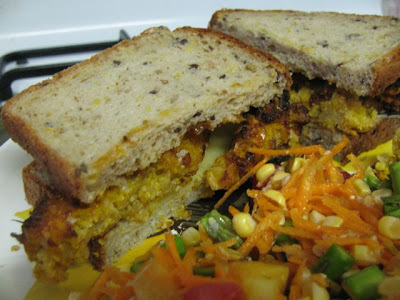 Hence, savoury food can be a welcome change, so I have tried to include a few savoury ideas. I have also shied away from choc chip cookies, decorated cupcakes and slices that might not last long. I have made gifts in the past, dropped them off for the recipient and found out later that they were not about for weeks. Food that lasts the distance is always welcome. My mum bakes mince tarts and sends them to my sister in Ireland at Christmas. My sister received a gift this year of a pretty jar of layers of ingredients for cookies with instructions to just add oil and egg (I think) when she is ready to bake. If you are more organised than me with your Christmas baking, then maybe these lists will be useful next year. I am sending the top photo to Jacqueline at Tinned Tomatoes for the No Croutons Required blog event that she co-hosts with Lisa of Lisa's Kitchen. This month the theme is a festive photo. I don’t think of ravioli as Christmassy but strangely enough the last time I attempted to make it was Christmas eve last year! Make of it what you will. Perhaps summer is the time to buy wanton (or geegaw) wrappers and then wonder what to do with them. This year’s ravioli happened at the end of the packet and the remaining filling morphed into a most delicious nut roast. 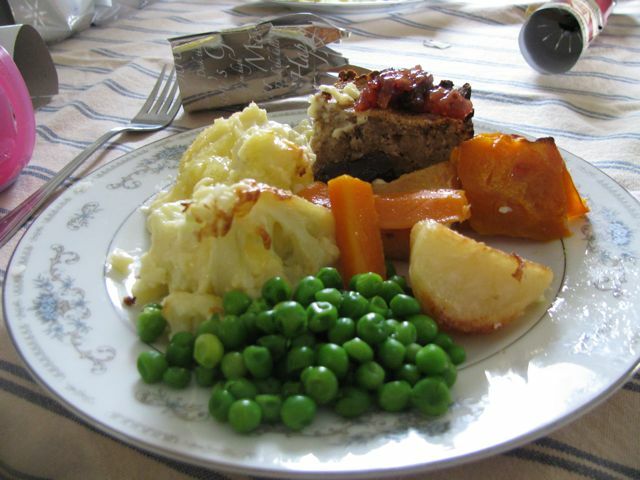 Now nut roast is definitely perfect for festive meals. I will be making my usual Christmas nut roast next week. This one that I made a week or two ago was surprisingly good. It was effortlessly vegan and gluten free. Much better than my last attempt at a GF vegan nut roast. I think the pumpkin was the key. It helps to bind and moisten and add flavour. No wonder I love pumpkin so much. Unfortunately I haven’t been finding time and energy to cook pumpkin lately so I had a wedge of it languishing in the fridge. A bit of dedicated scrapping and some roasting revived it and turned it into ravioli filling than then become nut roast that when chopped up and grilled till crispy reminded me of fishfingers. I don’t want to make any false promises. It was the look and crunchy exterior rather than the taste. But it did make me remember fishfinger sandwiches. I am also sending the ravioli to Ruth of Once Upon a Feast for Pasta Presto Nights. The weekly pasta blog event has hung up its boots for the year but will be back to inspire us with yummy pasta dishes early next year. Mash pumpkin and mix with all ingredients other than geegaw wrappers. Place a small spoonful of filling in the centre of a geegaw wrapper and use a brush or finger to dab water over half the edge of the wrapper (I found it easier to do this by holding the wrapper in my hand rather than lying it on a bench and easier to use my finger to dampen the edge). Fold wrapper over and seal at the edge. Set aside and fill remaining wrappers. If you have more wrappers you could freeze any extra ravioli. It is always recommended to freeze apart on a tray and then throw frozen ravioli into a bag so they don’t stick together when you take them out of the freezer. Cook straight out of the freezer – you probably need to cook them an extra couple of minutes but this is more guesstimate than experience. To cook the unfrozen ravioli, bring a large saucepan of salted water to the boil. Carefully place the ravioli in the boiling water and simmer for about 3-5 minutes until the “pasta” is cooked when tested. 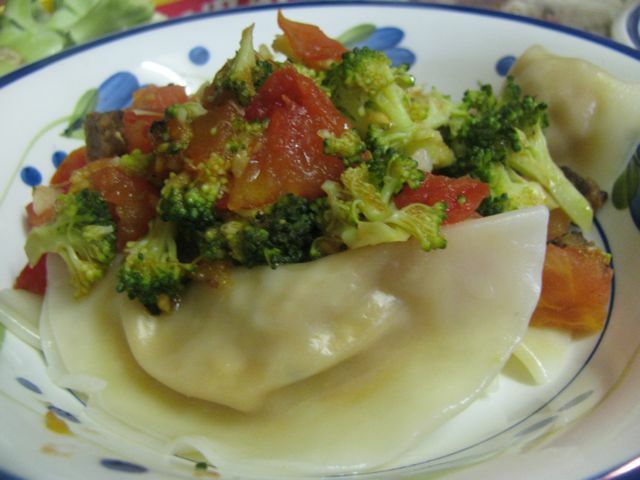 I served mine with a simple sauce of facon, broccoli and tomato. Cook rice (about 30 minutes). Mix with remaining ingredients and spoon into a lined or silicone loaf tin. (It shouldn’t be the consistency of batter rather than runny.) Bake loaf until lightly browned. I baked mine for 40-50 minutes at 200 C and then chopped into slices (which looked like “fingers”) the next day and grilled them till they were crispy. They were great in a sandwich with either cheese and chutney or mayonnaise and gherkins, accompanied by salad. 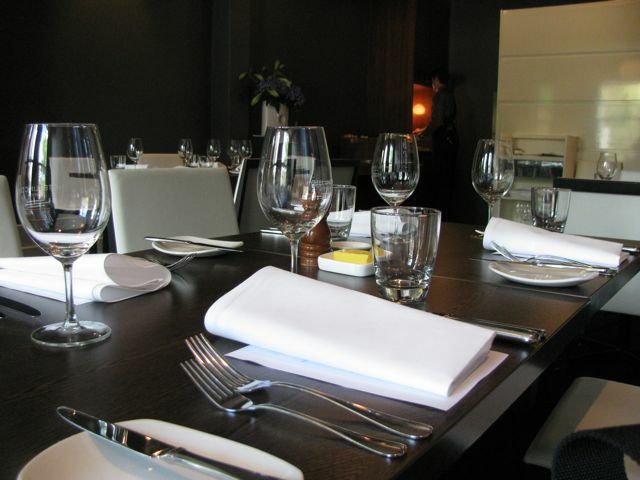 Yesterday we had a work Christmas lunch at the Hotel Lincoln. This is a pub where I have eaten a few times but not for a couple of years. 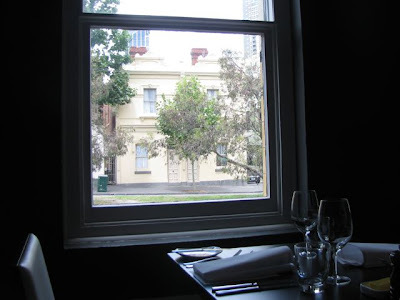 It has enough vegetarian offerings to interest me and while it is a notch above traditional pub grub, it is relaxed enough to be able to sit back and enjoy dinner. So I am pleased to be able to blog about it. 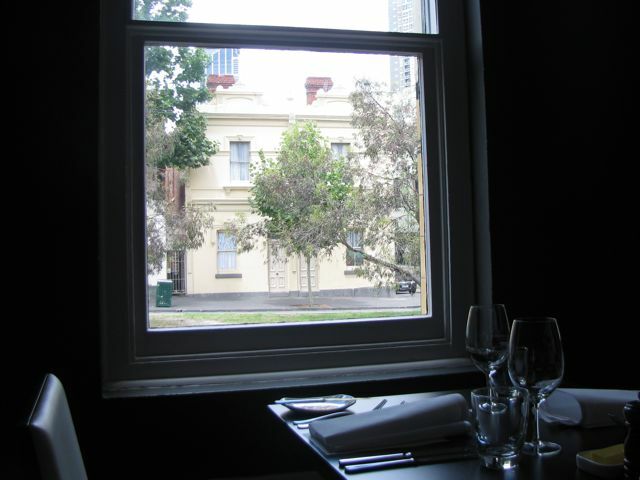 I have mostly eaten in the front bar but yesterday we had a three course lunch in the restaurant. I arrived early and was glad to be able to sit and re-group. I had spent the morning with Sylvia and 10 other 2 year olds on an excursion to the Melbourne Museum. I didn't realise just how tiring that was until I sank into my chair at the Hotel Lincoln. My colleagues arrived soon enough. It was all smoothly organised with dietary requirements sent to the kitchen beforehand and a Kris Kringle (or Secret Santa) present exchange. The presents brought us tears (the Leunig book) and laughter (the sticky notes with a tickbox for "I'd like to talk to you about the crap boss"), and a trip back to the office for a missing present! Fortunately we were able to amuse ourselves as the food was slow to come. I started with Ricotta Stuffed Zucchini Flowers, Smoky Eggplant, and Olive. This was my favourite dish because the combination of flavours was a triumph. I haven't had zucchini flowers many times before so I was pleased to have the opportunity to try them again. 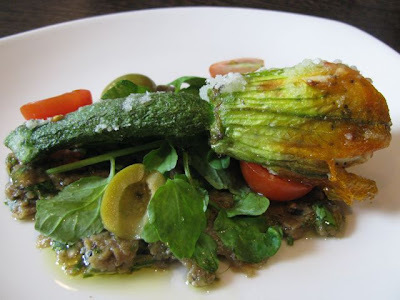 The delicate zucchini and ricotta were nicely contrasted with a smoky eggplant puree, olives, salad leaves and cherry tomatoes. 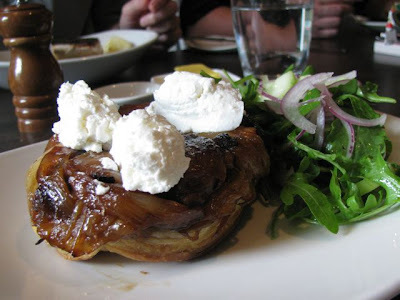 The main course was a Shallot Tarte Tatin with Goats Curd. Being vegetarian means a lack of choice when it comes to a set menu. Onions and goats cheese are not really my cup of tea. I gave a lot of the goats cheese to my colleagues and found the onion a bit too intense. I've had much worse but I was so full after this that it was difficult to find room for dessert. However, there was no way I was missing out on my Christmas Pudding with Brandy Butter. E and I spend much time discussing how restaurants and pubs just don't do proper Christmas dinners here like they do in the UK. So I appreciated that the Hotel Lincoln had made an effort to include some festive food in their menu. They didn't go as far as a Christmas tree. 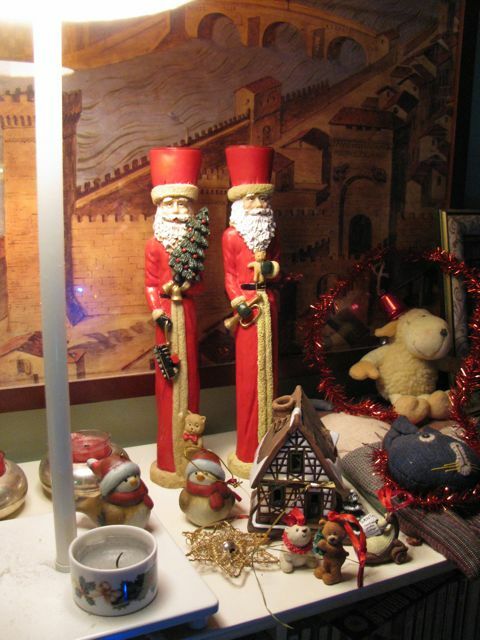 This one in the photo was brought along by my colleague, Penny, who loves Christmas! The pudding was lovely with wonderfully flavoured brandy butter. I didn't even miss the custard that I would traditionally eat with pudding. Unfortunately the food was so slow to come out that about half the table had left by the time dessert arrived. Despite this, I enjoyed the meal and hope I will be back soon. I will leave you with a photo of giraffes. A couple of years ago I shared my disappointment about the lack of giraffes in the Museum. 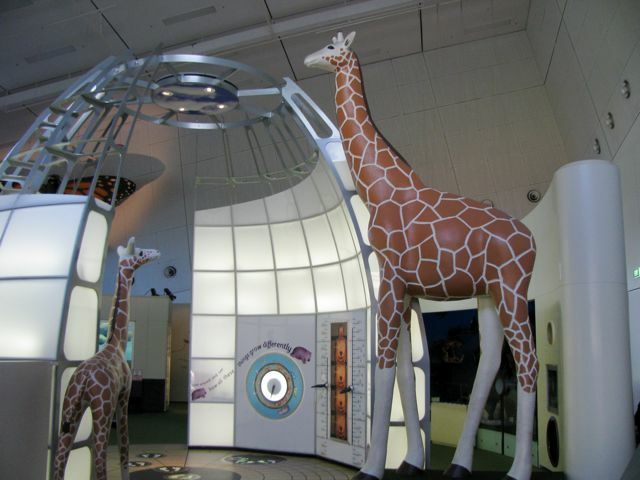 It seems there are giraffes in the children's area but they are not the same as the stuffed ones that I remember from when I was a child. The museum has improved the taxidermied animal display and now has some fearsome expressions from lions and bears that didn't bother Sylvia at all. She was more interested in the koalas. I still hope for the return of the giraffes.